Rudolph and Frosty's Christmas in July (titled on-screen as Rudolph and Frosty: Christmas in July, or simply Rudolph and Frosty) is an American Christmas/Independence Day television special produced by Rankin/Bass, featuring characters from the company's holiday specials Rudolph the Red-Nosed Reindeer and Frosty the Snowman, among others. 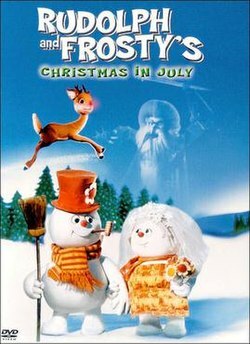 It is the third television special to feature the Rudolph the Red-Nosed Reindeer and Frosty the Snowman characters, respectively. It was filmed in Japan using the company's trademark "Animagic" stop-motion animation style. The film premiered in the US on November 25, 1979 on ABC. This was the last Rankin/Bass special to star Billie Mae Richards as Rudolph and Jackie Vernon as Frosty. Mickey Rooney reprised his role as Santa Claus from Santa Claus is Comin' To Town and The Year Without A Santa Claus. He would voice Santa again in Film Roman's The Happy Elf in 2005, but would not return as Santa for a Rankin-Bass special until A Miser Brothers' Christmas in 2008. Additional voices were provided by Red Buttons, Ethel Merman, Alan Sues, Paul Frees, and Thurl Ravenscroft. Shelley Winters reprised her role as Frosty's wife Crystal from Frosty's Winter Wonderland, and Hal Peary reprised his role as Big Ben the Clockwork Whale from Rudolph's Shiny New Year. Long ago, the evil ice wizard Winterbolt reigned over the North Pole, oppressing the inhabitants and spreading misery until Lady Boreal, the Queen of the Northern Lights, ended his tyranny by sending him into a deep sleep. Soon after, Winterbolt is severely weakened by the act. In Winterbolt's absence, a young Kris Kringle comes to the North Pole to build his workshop, and begins his tradition of delivering gifts to the world's children each Christmas Eve as Santa Claus. Years later, Winterbolt awakens. He discovers Santa, and consults his Genie of the Ice Scepter for answers on how to get rid of him. The Genie tells Winterbolt to have his snow dragons create a blizzard next Christmas to trap Santa, so that Winterbolt can take his place and conquer the world. Lady Boreal, anticipating this, visits a newborn reindeer named Rudolph and puts the last of her power into his nose, making it glow bright red. She warns Rudolph, however, that if he ever once uses his power for evil, his nose will stop glowing forever. That Christmas, Rudolph successfully guides Santa's sleigh through the blizzard. Winterbolt witnesses this and realizes Rudolph is his only opposition. One summer, Frosty the Snowman and his family visit Rudolph, though Winterbolt unsuccessfully tries to extinguish his nose. The Genie tells Winterbolt that Rudolph is still protected by the Northern Lights in their presence, and advises him to wait for Rudolph to leave the North Pole. Soon, Milton the ice cream man, who travels with a hot air balloon to pick up his ice cream to take to the seashore for the Fourth of July celebration, arrives heartbroken because he wishes to marry Laine Loraine, a tightrope walker and daughter of Lily Loraine, who runs the Circus by the Sea. However, the circus is going bankrupt as a crook named Sam Spangles wants to take over the show. To help save the circus, Milton suggests to Rudolph that he should star in the circus, as well as Frosty and his family. Unfortunately, Frosty denies the offer, saying they would melt quick until Winterbolt appears and gives them magic amulets to keep them from melting until the last firework disappears on the Fourth of July. Santa then suggests that he and Mrs. Claus will arrive at the circus to take Frosty and family back to the North Pole just before the fireworks end. However, Winterbolt's dragons create another blizzard to stop Santa and Mrs. Claus from making it to the circus grounds on time. He then goes to the Cave of Lost Rejections where he recruits an evil, unintelligent reindeer named Scratcher, who was jealous because he wanted to be one of Santa's reindeer, but got fired after Santa hired Rudolph. Scratcher then flies to the circus grounds, and after being offered a job as a roustabout, tricks Rudolph into stealing money from the box office wagon for Spangles, but Frosty catches them. As the fireworks end, Winterbolt returns and offers to extend Frosty's amulets infinitely if Rudolph agrees to appear guilty. Rudolph does so, causing his friends to reject him and his nose to stop glowing. Frosty tries to reason with everyone, but Rudolph warns him that he and his family will melt if he does so. Spangles subsequently buys the circus. Rudolph walks alone to the seashore, despondent, though Lady Boreal, in the form of the Northern Lights, appears and tries to console him. Then Big Ben the Clockwork Whale visits and Rudolph tells him of his troubles. Big Ben suddenly leaves, telling Rudolph he has to go to South America. Meanwhile, Winterbolt asks the Genie about Frosty, who wonders what he'd give in exchange to help Rudolph. Winterbolt realizes his hat is what brings him to life and wishes to steal the hat, find the secret of its magic, and duplicate it to bring an army of evil snowmen to life. He steals Frosty's hat, making him inanimate, but Rudolph ambushes him, steals the hat back, and regains his nose's glow thanks to his act of goodness. Rudolph returns to the circus the next day with a policeman, returning Frosty's hat and exposing Winterbolt's ruse. Scratcher flees while the policeman arrests Spangles and Lilly gets the circus back. Winterbolt appears and tries to attack everyone, but Lilly shatters his scepter, destroying his magic and causing him to turn into a lifeless tree. Frosty's amulets also lose their power, causing him and his family to melt. Everyone is distraught and knows that only a magic December wind can bring Frosty back to life. To their joy, Big Ben returns from South America with Jack Frost, who revives Frosty and his family with his icy breath. Once Frosty and family are fully revived, Santa and Mrs. Claus finally arrive to bring them back to the North Pole, while Rudolph stays with the circus to help them out of debt, which Lilly lets him lead the flying circus parade to thank him. Television programs directed by Arthur Rankin Jr.